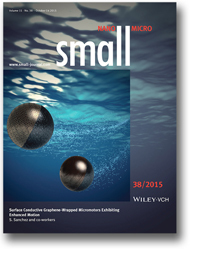 Chemically powered micro- and nanomotors are small devices that are self-propelled by catalytic reactions in fluids. These synthetic systems form a relatively new class of active matter, natural examples of which include flocks of birds, collection of cells and suspensions of bacteria. A number of promising applications have been envisioned for these micro-nano motors, such as targeted drug delivery, environmental remediation and as pick-up and delivery agents in lab-on-a-chip devices. These applications rely on the basic functionalities of self-propelled motors: directional motion, sensing of the local environment, and the ability to respond to external signals. Our group works on the design and study of new types of synthetic motors towards these applications and develops proof-of-concept studies to demonstrate their viability. Below are some of the projects that we are currently working on. Enzymes can be coupled with synthetic nano and micro structures to create efficient, bio-compatible nanomotors. Enzymes trigger biocatalytic reactions, which can convert chemical energy into kinetic motion for bioprocesses, for example, intracellular protein transport. The use of enzyme catalysis is emerging as an attractive alternative to power micro- and nanomachines due to their unique features including biocompatibility, versatility and fuel bioavailability. Our group has pioneered the use of different enzymes, including urease and glucose oxidase, to generate active propulsion, opening the door to new applications in biomedicine. We have recently demonstrated that using enzyme-powered nanomotors can improve anti-cancer drug delivery in vitro. In addition, we are also interested in the fundamental aspects underlying the motion mechanism of biocatalytic microswimmers to be able to design efficient and safe nanomotors. 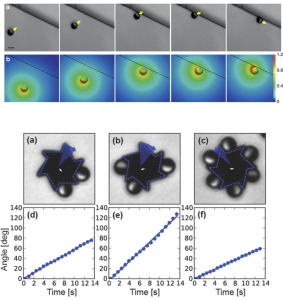 Phoretic and hydrodynamic interactions with nearby surfaces can be exploited to create a guidance mechanism for self-propelled particles and to self-assemble micro-gears. We study colloidal suspensions of Pt-coated silica particles as a model system of synthetic active matter. These systems have mostly been studied in homogeneous environments until now. Our interest lies in observing these systems in more complex settings, such as near interfaces. We focus both on hard interfaces, like solid walls, and soft interfaces, such as an oil-water interface. Since the self-propelled particles generate chemical and hydrodynamic fields around them, they interact in complex ways with nearby surfaces that often leads to interesting behaviour. We could find, for instance, that close to solid surfaces they achieve a stable ‘gliding’ state which could be exploited to develop a system for guiding micro-nano motors using topographical features. The same effect could also be used to self-assemble micro-motors around passive structures to form micro-gears. Micromotors can remove a wide variety of pollutants in contaminated water. Artificial micromotors, based on bubble self-propulsion have demonstrated to be able to mix solutions and enhance chemical reactions while they swim. These micromotors are mostly based on two main structures, tubular and spherical. First, we have designed tubular micromotors, which use hydrogen peroxide as a fuel, using different techniques such as, ‘rolling-up’ and electrodeposition. ‘Rolling-up’ microjets with a functional iron based layer can generate and actively transport free radicals in the solution performing the degradation of organic dyes via Fenton-like reactions in presence of hydrogen peroxide. On the other hand, electrodeposited microjets, which are smaller than their ‘roll-up’ counterparts, contain graphene-oxide on the outside working as ‘heavy metal scrubbers’. In this case, the metal is adsorbed and removed from the contaminated water. The metal can thereafter be desorbed and the microjets used again. 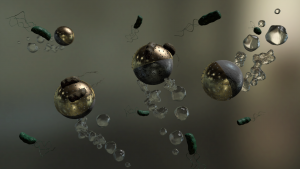 In order to target other water pollution problems, such as microorganism contamination, we have developed spherical microbots that can kill bacteria while they swim. These microbots have a Janus structure based on spherical magnesium microparticles, able to dissolve in water producing hydrogen bubbles, covered in one of their faces by Fe, Au and AgNPs which provide magnetic, bacteria attachment and bactericidal properties to the microjets. Recently, due to the necessity of scaling-up of the micromotor synthesis for cleaning large volumes of water, we have fabricated micromotors using exclusively chemical methods such as, precipitation, reduction and sol-gel chemistry. These micromotors are based on a silica microtubular structure which contains an inner-layer of a catalytic material (PtNPs or MnO2) capable of removing pollutants efficiently from water while they swim in the presence of hydrogen peroxide. The external decoration of these structures with magnetic nanoparticles provides for good magnetic control. Finally, magnetic and catalytic micromotors formed by the aggregation of cobalt ferrite nanoparticles were synthesized to remove anti-biotics from water. All these micromotors, due to their magnetic properties can be removed from the solution after finishing their targeting action by the application of an external magnetic field. 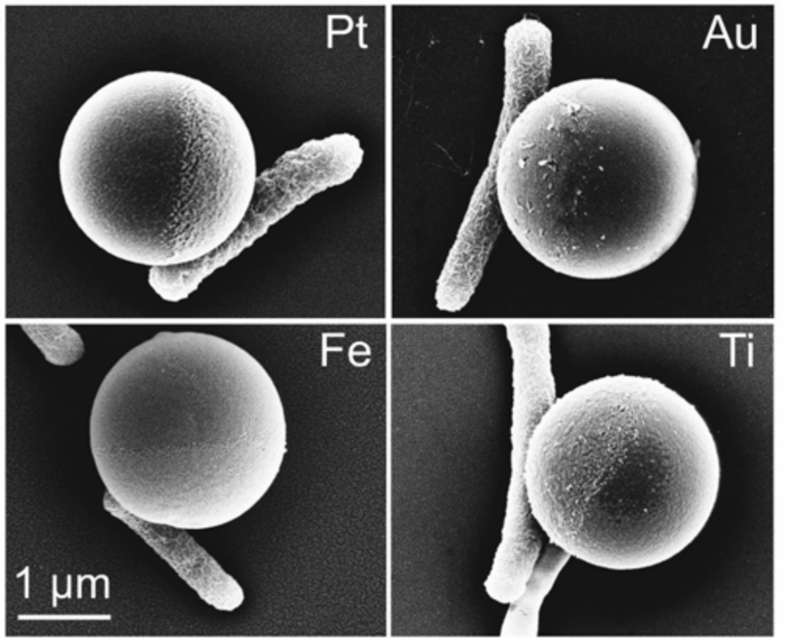 Bacteria can be selectively adhered to metal caps of ‘Janus’ colloids to create multi-flagellated bio hybrid systems. Bio-hybrid motors focus on the interaction of a motile cell with artificial materials to create a mobile system that is powered by cellular actuation. Bio-hybrids are not powered by toxic chemical fuels but by biological fluids, making them ideal for biomedical applications. They are responsive to their local environment (pH, temperature, and chemical gradients) and are capable of performing complex tasks that synthetic-only motors would not be capable of. We have coupled E. coli bacteria with metal capped ‘Janus’ colloids to create a multi-flagellated bio-hybrid system. E. coli adheres selectively to the metal cap of the Janus particle and the polystyrene side of the Janus particle can be used for localized drug attachment. We have also recently used tubular bio-hybrid motors powered by magnetotactic bacteria to target bio-films. Electrodes fabricated on flexible substrates are modified with a wide range of materials for selectivity towards biomarkers. Analytes are quickly quantified by electrochemical techniques. Point-of-care diagnostics is a promising complementary approach to clinical diagnostics performed at hospital settings. Decentralized monitoring of health parameters allows to improve quality of life of patients, enhance therapeutic efficacy thanks to more frequent tests, and lower the overall cost of the health system. We develop flexible biochemical sensors for non-invasive, cost-effective and personalized monitoring of bio-analytes in biological fluids. 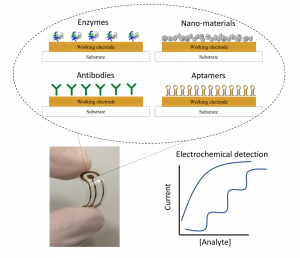 We focus on sensors based on electrochemical detection, as they are particularly suited for low-cost, portable and user-friendly medical diagnostics. In the recent research line of soft hybrid bio-robotics, we explore the integration of biological tissue and artificial materials at larger length scales. In particular, we take advantage of the 3D bioprinting technique to develop bio-robotic systems composed of skeletal muscle cells embedded in biocompatible hydrogels, which can be 3D bioprinted alongside other artificial materials. 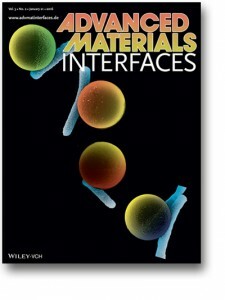 These materials can act as scaffolds, support, or flexible parts, as well as be responsive upon certain stimuli. By controlling the contractions of skeletal muscle cells via electric fields, we can envisage different ways of actuation, paving the way for complex hybrid systems. For a list of publications prior to joining IBEC, visit the MPI for Intelligent Systems website. The quest to provide clean water to the entire population has led to a tremendous boost in the development of environmental nanotechnology. Towards this end, micro/nanomotors are emerging as attractive tools to improve the removal of various pollutants. The micro/nanomotors are either designed with functional materials in their structure, or are modified to target pollutants. The active motion of these motors improves the mixing and mass transfer, greatly enhancing the rate of various remediation processes. Their motion can also be used as an indicator of the presence of a pollutant for sensing purposes. In this Perspective, we discuss different chemical aspects of micromotors mediated environmental clean-up and sensing strategies along with their scalability, reuse and cost associated challenges. To achieve control over naturally diffusive, out-of-equilibrium systems composed of self-propelled particles, such as cells or self-phoretic colloids, is a long-standing challenge in active matter physics. The inherently random motion of these active particles can be rectified in the presence of local and periodic asymmetric cues given that a non-trivial interaction exists between the self-propelled particle and the cues. Here, we exploit the phoretic and hydrodynamic interactions of synthetic micromotors with local topographical features to break the time-reversal symmetry of particle trajectories and to direct a macroscopic flow of micromotors. We show that the orientational alignment induced on the micromotors by the topographical features, together with their geometrical asymmetry, are crucial in generating directional particle flow. We also show that our system can be used to concentrate micromotors in confined spaces and identify the interactions responsible for this effect. Finally, we develop a minimal model which identifies the main parameters of the system responsible for the observed rectification. Overall, our system allows for robust control over both temporal and spatial distribution of synthetic micromotors. In the past few years there has been growing concern about human exposure to endocrine disrupting chemicals. This kind of pollutants can bioaccumulate in aquatic organisms and lead to serious health problems, especially affecting child development. Many efforts have been devoted to achieving the efficient removal of such refractory organics. In this regard, a novel catalyst based on the combination of α-FeOOH and MnO2@MnCO3 catalysts has been developed by up-scalable techniques from cheap precursors and tested in the photo-Fenton-like degradation of an endocrine disruptor. Almost total degradation of 17α-ethynylestradiol hormone was achieved after only 2 min of simulated solar irradiation at neutral pH. The outstanding performance of FeOOH@MnO2@MnCO3 microspheres was mainly attributed to a larger generation of hydroxyl radicals, which are the primary mediators of the total oxidation for this hormone. This work contributes to the development of more cost-effective systems for the rapid and efficient removal of persistent organic pollutants present in sewage plant effluents under direct solar light. The integration of biological tissue and artificial materials plays a fundamental role in the development of biohybrid soft robotics, a subfield in the field of soft robotics trying to achieve a higher degree of complexity by taking advantage of the exceptional capabilities of biological systems, like self-healing or responsiveness to external stimuli. In this work, we present a proof-of-concept 3D bioprinted bio-actuator made of skeletal muscle tissue and PDMS, which can act as a force measuring platform. The 3D bioprinting technique, which has not been used for the development of bio-actuators, offers unique versatility by allowing a simple, biocompatible and fast fabrication of hybrid multi-component systems. Furthermore, we prove controllability of contractions and functionality of the bio-actuator after applying electric pulses by measuring the exerted forces. We observe an increased force output in time, suggesting improved maturation of the tissue, opening up possibilities for force adaptability or modulation due to prolonged electrical stimuli. Biofilm colonies are typically resistant to general antibiotic treatment and require targeted methods for their removal. One of these methods include the use of nanoparticles as carriers for antibiotic delivery, where they randomly circulate in fluid until they make contact with the infected areas. However, the required proximity of the particles to the biofilm results in only moderate efficacy. We demonstrate here that the non-pathogenic magnetotactic bacteria, Magnetosopirrillum gryphiswalense (MSR-1), can be integrated with drug-loaded mesoporous silica microtubes (MSMs) to build controllable microswimmers (biohybrids) capable of antibiotic delivery to target an infectious biofilm. Applying external magnetic guidance capability and swimming power of the MSR-1 cells, the biohybrids are directed to and forcefully pushed into matured Escherichia coli (E. coli) biofilms. 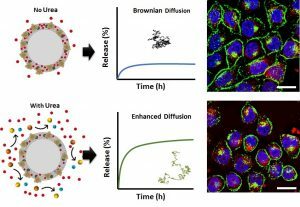 Release of the antibiotic, ciprofloxacin (CFX), is triggered by the acidic microenvironment of the biofilm ensuring an efficient drug delivery system. The results reveal the capabilities of a non-pathogenic bacteria species to target and dismantle harmful biofilms, indicating biohybrid systems have great potential for anti-biofilm applications. Self-propelled micro/nano-devices have been proved as powerful tools in various applications given their capability of both autonomous motion and on-demand task fulfilment. Tubular micro-jets stand out as an important member in the family of self-propelled micro/nano-devices and are widely explored with respect to their fabrication and functionalization. A few methods are currently available for the fabrication of tubular micro-jets, nevertheless there is still a demand to explore the fabrication of tubular micro-jets made of versatile materials and with the capability of multi-functionalization. Here, we present a facile strategy for the fabrication of mesoporous silica micro-jets (MSMJs) for tubular micromotors which can carry out multiple tasks depending on their functionalities. The synthesis of MSMJs does not require the use of any equipment, making it facile and cost-effective for future practical use. The MSMJs can be modified inside, outside or both with different kinds of metal nanoparticles, which provide these micromotors with a possibility of additional properties, such as the anti-bacterial effect by silver nanoparticles, or biochemical sensing based on surface enhanced Raman scattering (SERS) by gold nanoparticles. Because of the high porosity, high surface area and also the easy surface chemistry process, the MSMJs can be employed for the efficient removal of heavy metals in contaminated water, as well as for the controlled and active drug delivery, as two proof-of-concept examples of environmental and biomedical applications, respectively. Therefore, taking into account the new, simple and cheap method of fabrication, highly porous structure, and multiple functionalities, the mesoporous silica based micro-jets can serve as efficient tools for desired applications. Laboratorio de enfermedades metabólicas hereditarias, Hospital Sant Joan de Déu, Barcelona. We are happy to receive CVs and enquiries from talented individuals. Prospective students and staff are encouraged to contact us to discuss possibilities. Please feel free to suggest new projects, areas of research or new ideas. Current job openings in the group are listed on the jobs page. IBEC group leader and ICREA research professor Samuel Sánchez is quoted in an article in Inside Science about enzymes that could counteract the effects of toxic nerve agents. An IBEC project has won funding from the BBVA Foundation under its ‘Ayudas a Equipos de Investigación en Biomedicina’ funding programme. Samuel Sánchez features in a long article in Retina magazine (El País). Researchers working at IBEC and the Max Planck Institute for Intelligent Systems have developed nanomotors that are powered by a fuel-free, biofriendly and unlimited power source: light. IBEC researchers have demonstrated that their enzyme-powered nanobots show a marked improvement in drug delivery efficiency over passive ones. In the Què Qui Com program that aired yesterday on Canal 33, Samuel Sánchez, ICREA research professor at IBEC, explained the work being done in his group to develop nanorobots that can release drugs in a controlled manner. A paper by IBEC’s Smart nano-bio-devices group addresses the problem of biofilms, the “microbe cities” that enhance cell-to-cell communication for bacteria, allowing infection to thrive and increasing the chances of evading the immune system. In the body, they can be found in a wide variety of microbial infections, such as in the lungs of cystic fibrosis or chronic obstructive pulmonary disease patients. Samuel Sanchez has broken his own Guinness World Record for the smallest jet engine. Samuel Sanchez is featured in an article in QUO magazine that discusses how chemistry and technology are combining to offer sustainable solutions for society and the planet. The press release about Samuel Sanchez’s recent paper in ACS Applied Materials & Interfaces that describes tiny robots that can remove disease-causing bacteria from water got coverage in La Vanguardia’s Big Vang section, rTVE and other outlets. 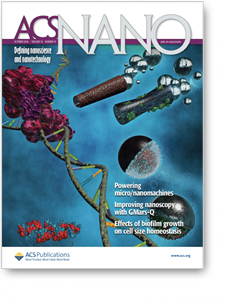 ACS highlights our work on using microbots to kill pathogenic bacteria. This weekend Samuel Sanchez was interviewed by El Punt Avui and ABC talking about nanorobots and the future of medicine. Premi Nacional de Recerca winners Samuel Sanchez and ICFO’s Lluís Torner appeared on El Punt Avui’s L’Illa de Robinson programme on Wednesday, after the awards ceremony on Tuesday night. It’s just one example of the huge amount of press coverage there’s been about the awards. IBEC group leader and ICREA research professor Samuel Sánchez was one of the five honorees at the ceremony of the Premis Nacionals de Recerca 2016 of the Fundació Catalana per a la Recerca i la Innovació (FCRI). IBEC group leader and ICREA researcher Samuel Sánchez has been announced as the winner of this year’s Premi Nacional de Recerca al Talent Jove (National Research Award for Young Talent) from the Generalitat de Catalunya and the Catalan Foundation for Research and Innovation (FCRI). IBEC group leader and ICREA research professor Samuel Sanchez’s latest nanojets have set a new world record for the smallest man-made jet engine ever. An audience of nearly a hundred enjoyed a special public seminar by IBEC group leader and ICREA research professor Samuel Sánchez. The Smart nano-bio-devices group leader’s talk, Nanorobots de la ciència-ficció a la realitat, which took place in the PCB’s Sala Dolors Aleu, was one of this year’s Setmana de la Ciència events. Group leader and ICREA professor Samuel Sanchez appeared as a guest on the La 2 magazine programme Tips on Wednesday 19th. Group leader Samuel Sanchez appeared on Telediario, channel 1’s news programme, commenting about the work of the Nobel Prize winners for chemistry, which were announced in the first week of October. A round table discussion involving Samuel Sánchez, last year’s winner of the Princess of Girona Foundation (FPdGi) Award for Scientific Research, and other former winners was filmed at the recent FPdGi 2016 awards ceremony in Girona. Samuel Sanchez features in an article in ARA magazine this week which marks the 15th anniversary of ICREA. A video of Samuel Sánchez taking part in April’s Festival de Nanociencia y Nanotecnología. Samuel Sánchez’s recent NanoLetters paper about self-propelled tiny ‘microbots’ that can remove lead from contaminated water gets lots of coverage this week by news channels such as Discovery News, Phys.org and several more. Samuel Sánchez featured on Oficiorama, a programme devoted to the technology of the future, which airs on TV2 on Saturdays. IBEC researchers have developed a self-propelled tiny ‘microbot’ that can remove lead from contaminated water. Samuel Sanchez and the part of his lab that resides at the MPI for Intelligent Systems in Stuttgart feature in a chapter of a video series by El Pais, La Carrera Especial. IBEC group leader and ICREA research professor Samuel Sánchez is the winner of this year’s edition of the Círculo Ecuestre’s Premio Joven Relevante. Samuel Sanchez’s recent Nature Communications paper on micromotors that use surface variations for docking and guiding was the subject of an article in El Mundo today. IBEC group leader and ICREA research professor Samuel Sánchez was one of two scientists taking part in a studio discussion on La Sexta Noche on Saturday, in a segment about what it’s like to be a talented young scientist or entrepreneur in the financial climate of Spain today. Researchers at the Institute for Bioengineering of Catalonia (IBEC), the Max-Planck Institute for Intelligent Systems and the University of Stuttgart have revealed in an article in Nature Communications today that micromotors can be guided using tiny topographical patterns on the surfaces over which they swim. Samuel Sánchez’s nanorobots are one of the “Seis aplicaciones robóticas que no conocías” described in an article in El País today. IBEC group leader and ICREA research professor Samuel Sánchez is to receive an ERC Proof of Concept grant to explore the innovation potential of some of his research. His project “Active microcleaners for water remediation” (Microcleaners) will tackle the huge rise in pollutants in water that has been the result of the massive growth in industrial, domestic and agricultural activities. Article and video at Informativos.net. Following his appearance at Emtech France in Toulouse in December 2015, Samuel Sánchez featured in French daily newspaper La Tribune. (See the video of Samuel’s talk at Emtech France here). An IBEC researcher and his collaborators have taken the next step in their quest to achieve safe micromotors for medical drug and cargo delivery by developing a version that is powered by bacteria. El País has published a “Ciencia en Español” video interview with Samuel Sanchez featuring footage of his nanorobots, which can be seen whizzing through through liquid using the expulsion of oxygen bubbles as propulsion. A video about Samuel Sanchez and his work is the latest addition to the El País/Vodafone One video archive. The collection helps promote the public understanding of technology, scientific advances and innovations, and how they affect our daily lives. IBEC group leader Samuel Sánchez was one of the experts invited to attend the Innovators Under 35 European Summit in Brussels last week, a gathering of the European winners of MIT Technology Review’s “Innovators under 35” list. IBEC group leader Samuel Sanchez was one of the experts and professionals invited to take part in CEDE’s “Talento en Crecimiento” event at the Palacio de Exposiciones y Congresos in A Coruña at the beginning of the month. Researchers at IBEC and their collaborators have made a breakthrough in nanomotors for applications in medicine by developing the first ever fully biocompatible self-propelling particles that are powered by enzymes that consume biological fuels, such as glucose. IBEC group leader Samuel Sánchez was the subject of La Vanguardia’s “Big Vang questionnaire”. On 30 June the rtve science programme Lab24 featured an interview with new IBEC group leader Samuel Sánchez, who describes his research on micro and nanomotors. IBEC group leader Samuel Sánchez was the subject of an article in El Periódico on Tuesday. An article about new IBEC group leader Samuel Sanchez by Josep Corbella in La Vanguardia yesterday talks about the ‘brain gain’ of having the nanotechnologist return to Catalonia after several years in Japan, the USA and Germany. El Periódico features an interview with Samuel Sànchez following the announcement last week that he has been awarded the Premio Fundación Princesa de Girona Investigación Científica 2015. IBEC group leader Samuel Sánchez is this year’s winner of the Premio Fundación Princesa de Girona Investigación Científica for his advances in in the field of nanotechnology. Samuel’s work was recognised in particular for his pioneering design of self-propelled nanorobots that could improve the accuracy of drug delivery, as well as having potential environmental applications. New IBEC group leader Samuel Sánchez appears in articles in El Mundo and El Periodico today, talking about his career so far, his new appointment at IBEC and the work he will be continuing on micro- and nanomotors. One of the world’s top researchers – and a record-breaker – in the field of nano- and microrobots is coming to Barcelona to continue his career. The Institute for Bioengineering of Catalonia (IBEC) welcomes Dr. Samuel Sánchez (Terrassa, 1980), who is taking up a new Group Leader position there this month.